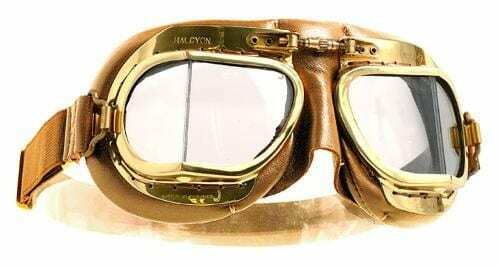 The polished-brass finish of the Mark 49 Antique goggle gives the impression of a truly vintage product and looks great with older scooters and motorbikes. The brass frame is polished to a mirror-finish and then it is coated with hard clear lacquer. It is then hand-stitched to a soft leather facemask. The nose bridge screw is made from brass and offers a fine adjustment. The lenses are made from 99% UV-protected polycarbonate that is treated with a scratch-resistant coating to prevent damage to the surface. 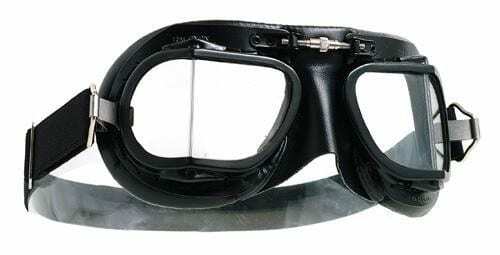 Each lens is housed in an independent frame and can be easily removed from the goggle to allow replacements to be fitted or to be easily switched with tinted lenses if the sun happens to be shining. The polished-brass finish of the Mark 49 Antique goggle gives the impression of a truly vintage product and looks great with older scooters and motorbikes. The brass frame is polished to a mirror-finish and then it is coated with hard clear lacquer. It is then hand-stitched to a soft leather facemask. The nose bridge screw is made from brass and offers a fine adjustment. The lenses are made from 99% UV-protected polycarbonate that is treated with a scratch-resistant coating to prevent damage to the surface. Each lens is housed in an independent frame and can be easily removed from the goggle to allow replacements to be fitted or to be easily switched with tinted lenses if the sun happens to be shining. The head band now also comes fitted with triple silicon, elasticated non-slip strips for the perfect grip when worn over an open face crash helmet. 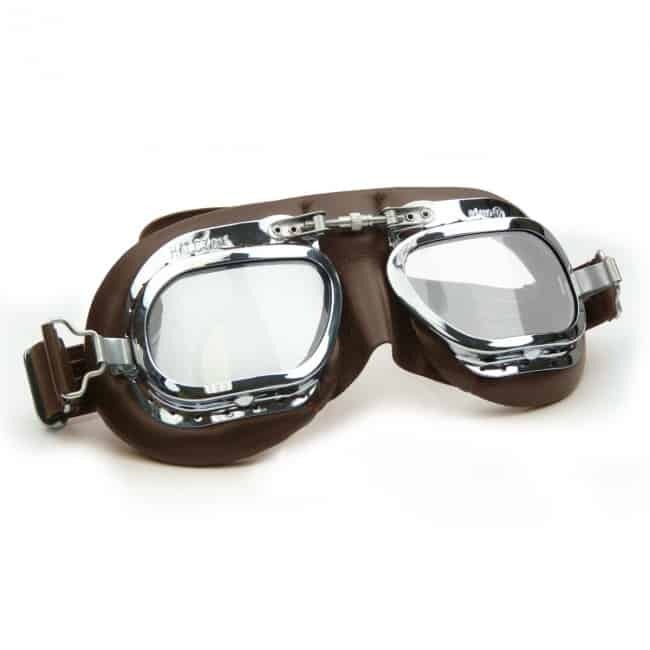 Classic British Style– The look of Halcyon goggle has remained the same for over 70 years, as first worn by RAF pilots during WWII. Moving through the ages the traditional goggle style has continued to be a unique and fashionable whether you are a Classic Motorcyclist, an open top vintage car owner, a Mod with an old Lambretta or Vespa or even a Steampunk enthusiast.